The Gilder Lehrman Institute presents an annual essay contest for Gilder Lehrman Affiliate School students in grades 6–12. Students examine the nation’s most divisive conflict through letters, speeches, songs, photographs, newspapers, military orders, and other documents, conducting research in primary as well as secondary sources. This year, students have the option of submitting a written essay or an entry in our new Documentary Film category. Top films will be well researched, well organized, and edited in a manner that is clear, articulate, and visually impactful. We strongly encourage collaboration between language arts and social studies departments to assist students with all aspects of the writing process, and between social studies and arts teachers to assist students with aspects of documentary film production and editing. The 2017–2018 Civil War Essay Contest is now closed. Winners will be announced in mid-March. Additional information, contest forms, a scoring rubric, and other important details on submissions can be found in the 2017–2018 Civil War Essay Contest information packet. …(aka BMI-ster), Guide, Recruiter, Organizer, Political Activist, Firebrand, Military Leader, Crusader for Women’s Rights, Senator… and dead before the age of 34. Now that is a life! Illiterate, his story and his voice are hard to trace, but historian David Cecelski of North Carolina got lucky and found a trove of letters written by Mary Ann Starkey of New Bern, NC. Starkey was a close confident and fellow activist who worked with Galloway during the Civil War years.Together with his other sources, Starkey’s letters made possible Cecelski’s forthcoming book on Galloway. I have used the information from Cecelski’s essay on Galloway in The Waterman’s Song, to make a google map of Galloway’s life. He lived large. Zoom way out right away, so that you can see the whole enchilada – North Carolina to Ontario, Ohio to Massachusetts. *The population of the New Bern NC at that time was 5,000. Galloway was the man. And then he faded from view. 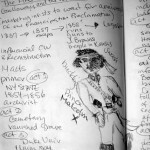 Cecelski’s book on the life of Abraham Galloway, The Fire of Freedom: Abraham Galloway and the Slaves’ Civil Warwill be released on September 29th, 2012. ( Or you can pre-order it from Amazon, like I did, and save a few bucks.) I strongly recommend you do, too, because Galloway is a guy we are enriched by meeting. 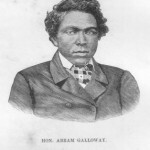 This is the drawing of Abraham Galloway as I imagined him while I listened to David Cecelski introduce him to me, my NEH buddy Kelly Price-Steffen, (Shout out to ya, Kelly!) and the New Bedford Historical Society last summer. Now I know it is not a good drawing; he defies gravity and looks like he is related to Burt Reynolds, and yet I feel it conveys the swashbuckling element I intended.